In my last post, I wrote about some common obstacles that teachers put forward as to why they don’t blog or use technologies in their classrooms. I discussed lack of time, lack of equipment, lack of keyboarding skills and internet safety along with possible solutions to these issues. The comments on this post were very insightful and I enjoyed hearing the viewpoints of others. The comment that stood out for me most was by Jonah Salsich. I’ve summarised what he said here but go back to the previous post to read his full comment. I think one of the biggest reasons some teachers are hesitant to blog … is the perceived learning curve. They know how to teach the way they always have … and that way works. Technology integration requires time investment, learning new skills, and troubleshooting … we are asking teachers to act as students. I’m beginning to think that working with technology might be a specific type of learning modality. We are familiar with the idea that students learn in different ways – spatially, kin-esthetically, linguistically, etc. It’s no different for teachers, we all have different learning strengths. … we shouldn’t assume that all teachers can pick up blogging the way many of us have. And I don’t think it has much to do with the whole “digital immigrant/digital native” idea. I’m a digital immigrant (never really used the internet until I started teaching 5 years ago) and I can spend hours tinkering with web applications … (teachers) just may struggle with the type of learning involved. This made me think, perhaps the unfamiliar learning style/modality is the biggest reason some teachers don’t get into blogging or technology integration? I came up with this diagram to explain my thoughts. Of course, it’s not this linear and exact but it is one way of thinking about the issue. The unfamiliar learning style could be the biggest obstacle people face when thinking about integrating technology into the classroom. For people like me (and probably you) this is no obstacle. We don’t know everything but we’re prepared to learn. We know that learning won’t be overly difficult. If the learning style is an obstacle for you, you might stop there. If not, then you can look at the issue of time. I put “perceived” lack of time because, to me, it is a perception. I know people with families and lots of commitments actually do have less time than others, however I’m sure we all know some educators who spend a lot of time chatting and “fluffing around” before/after school and during time release. Or, we know teachers who spend a lot of their time on tasks that could be replaced by blogging/technology. If you think you can’t find time you might stop there. Otherwise, you can look at the issue of support. School support is crucial however, I have see cases where apprehensive administrative teams or parents can be convinced with education. Often it is fear and lack of understanding that creates negative attitudes. 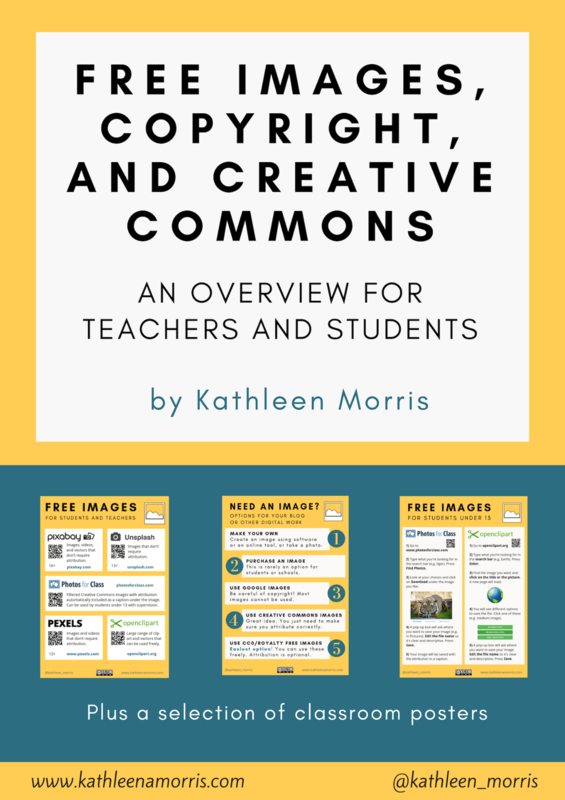 Getting parents to be actively involved in blogs is something I have written about before. Find that post here. Finding support from like-minded teachers really helps. Sometimes your school isn’t the only place to look for this support. I have found creating a professional learning network (PLN) online to be a fabulous way to become a better teacher. I wrote about how I use Twitter to create a PLN here. There is so much support out there, you just have to find it. If you can’t generate the support you need, you might stop there. Otherwise, you can look at the issue of equipment. Lack of computers is something I’ve already addressed but as Mrs W pointed out in my last post “Living in rural Australia, at home I can only get wireless broadband and at a low signal strength. Internet comes and goes on and off. Many of my parents have similar issues.” This is very frustrating and difficult to overcome, I know because up until early 2010 our school internet was so slow you could almost not use it! Hopefully the National Broadband Network will provide a solution for our rural classrooms. Sites being blocked is also frustrating although each school in Victoria can control what they want to block so maybe talk to your school technicians if this is an issue for you. Read my Tech Tools for Teachers about filtering in Victorian government schools for more information. Finally, if you can get past the issue of equipment and bandwidth there are a multitude of other obstacles that could be important and unique to you such as lack of keyboarding skills and student age. Overcoming these obstacles requires the desire to do so, and a positive and creative approach. However, just as the student who struggles with maths (or literacy, communication, etc.) still needs to learn those skills, teachers need to learn the new skills inherent in tech integration. Or do they?… Are their colleagues telling them they need to? Are their administrators telling them they need to? Are the parents telling them they need to? If not, then they don’t need to learn it. We would like them to because we see the benefits and we enjoy it, but until they need to learn it many of them won’t. If I didn’t demand that my students who struggle with maths learn it, they certainly wouldn’t do it on their own. The thing is, yes there are kids that don’t like maths and there are teachers that don’t like maths but can those teachers get away with not teaching maths? No way. When it comes to maths, reading, writing, history, geography and every other subject the answer is yes. Colleagues, admin and parents all expect the teacher to be teaching these things. Why is technology still optional? Such a big issue! There is not only the issue that experienced teachers need to be encouraged, expected and supported to make that change but new teachers training at university need to have technology made a priority. From my experience with unis and student teachers, this is not usually the case. Another issue is, teachers need to realise that their students are really missing out if they feel they cannot or will not integrate technology into their classrooms. It’s really doing their students a disservice. Maybe they don’t realise or maybe they choose not to think about this? The fact that teachers might find it difficult and it may not come easily to them makes it all the more important for it to be taken up by them. What a great message to be sending kids: I find this tough and challenging but I believe it’s important so I’m going to give it a go and try and do the best that I possibly can. That’s the message a lot of us try and pass onto our kids everyday so why not show them that we practice what we preach. Thank you to everyone else who took the time to comment on the post. I found all the comments incredible insightful and I encourage others to take a look! I’ve come to realise that I am lucky that technology is a learning modality that I’m comfortable with (if it was music, physics, woodwork or something, I’d struggle to say the least!) I want to help other teachers become more comfortable with this way of learning. I think it is important that this issue is discussed and personal teacher obstacles acknowledged. I believe the dialogue about solutions needs to be ongoing and support for all teachers to join us “where the grass is oh so green” is crucial. Kathleen – I think you’ve hit the nail on the head with your diagram. The digital immigrant/native thing doesn’t work because you’ll always find examples of older teachers comfortable with playing with technology and younger teachers who only turn their laptop on to mark the roll and write reports. I think it is a way of learning and it’s something that either sits well with you or not. However, equally, it’s something that those in powerful positions (at school and Department level) should be mandating. Whether you find it easy or not, it’s essential. Great, thought provoking post that I’ll be referring colleagues to – well done! Thanks so much for your comment. I have seen the exact same thing with younger and older teachers. In fact, some of the teachers in my PLN who have inspired me the most are quite a bit older than me! It is essential and I hope tech integration is actually mandated some day! I thought that this follow up to your previous post was great. I’m actually not going to comment on the post itself other than to say I really liked the diagram and explanations. What I found lovely about this post is that it really reflects what I’ve hoped to achieve from using my own and reading others’ professional learning blogs and that’s the dialogue that takes place both within the posts as comments and in this case, as a follow up to a comment that was made. This dialogue continuously helps us to challenge each others’ thinking in an environment where that sort of thing is encouraged and people don’t take offense to a differing opinion but instead see it as an opportunity to engage in a discussion and develop professionally. Thanks for providing such a relevant and thought provoking blog. So true! That is something I have been striving for with commenting. It’s not easy to get the converstaion and evolution of ideas happening but when it does I try to make the most of it! I hope to facilitate a lot more discussions like this this year. You, Jonah and others really helped me have a light bulb moment! Thanks for sharing such a great summing up from your previous post. I think that your diagram has summarized the issues in a very elegant manner. I agree with Gillian that this makes more sense than merely looking at the digital native/digital immigrant discussion that float around the internet. Thanks for your support and I’m glad it makes sense to others too! I agree that we’re beyond the immigrant/native debate! 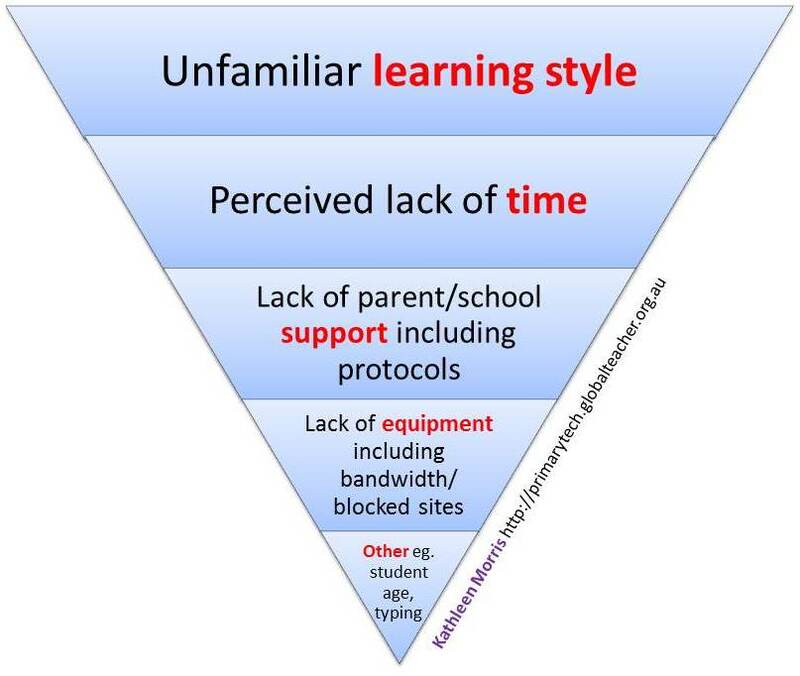 What a great diagram, you’ve perfectly captured the obstacles schools face when trying to get more staff onboard with the technology bandwagon. Actually, the word bandwagon is highly inappropriate, because it suggests using technology is a passing phase, and people like us know that is not the case! The thing is, even people who are comfortable using technology still have to invest time and energy into actually learning skills to implement in the classroom. And of course, it’s an ongoing process. Even those of us comfortable and confident with technology still engage with extensive online research. Our learning journeys are not complete either. I guess the big difference is that we love to learn and have no problems in spending our spare time online putting the effort in. With so many schools promoting a “personalised learning” approach, it is disappointing that there are still teachers reluctant to include aspects of technology into their programs. Maybe those teachers need to start small, even smaller than what we originally would have thought. Perhaps those teachers not confident with technology could set mini-goals for themselves, starting with things such as becoming familiar with the programs on the classroom computers. They may not work their way up to a class blog in the near future, but it’s all relative and developing teachers’ confidence is probably the first step. I haven’t come up with any solutions, but it is no doubt something that will continue to be discussed during the school year. That is another important point to raise – learning about tech may come a little easier to us than others but we also invest an enormous amount of time teaching ourselves and playing around. People do need to realise that they will have to invest some time. I think a mini goal is the way to go. You and I have both found, often people get overwhelmed so decide to do nothing. As long as people are doing something towards updating their teaching and learning practices, they’re off to a good start! Terrific post – it has generated such quality comments. Something else I think is valuable is the PR or marketing that comes as quite forced or stilted when you first start blogging. Part of the ‘blogging learning’ is to read, read, read other blogs and comment, comment, comment to generate traffic to and from your own blog. I know this is something some ‘L plate’ blogging teachers struggle with ‘I put a post up last week and I have only had two comments – both from students’. You must promote at any opportunity – assembly, newsletter, parent sessions, a laminated business card that goes home with your blog/email address on it to be put on the fridge, blog everyday and the kids will go home and teach the parents etc Make it fun, fun, fun! So true – you have to be part of the blogging community. Why would anyone want to look at your blog if you don’t look at theirs? And encouraging parents is an ongoing thing. Good luck tomorrow. First day back! Unfortunately, not every teacher sees technology, blogging, or online collaboration as important, and therefore not worth the perceived time investment. Tech skills are not assessed, they don’t impact test scores (expect for the perception that they take time away from test prep), and there generally isn’t a place on report cards to evaluate tech skills. Therefore the message many teachers get is that tech might be innovative and “cool” but they aren’t accountable for teaching it, and because it isn’t assessed it isn’t highly valued by administrators. So, how do we convince teachers that these are skills worth learning? When I think about how to teach a new skill to a student that finds it foreign and uninteresting, I know I have to make that skill engaging, hands-on, and relevant to that student. So, if we think of teachers as students we need them to see these skills as engaging and relevant. The engaging part wouldn’t seem to be too difficult (although…), but the relevant part is where I think it gets a little harder. If they aren’t accountable for it, they may not find it relevant. That may seem unfortunate, but how many people (students, teachers, whoever) are going to to take the time to learn something difficult and uninteresting if they don’t see any reason to? Perhaps one of the best things we can do is simply to continue to model how engaging (and educational!) it is for our students and trust that the buzz will spread. I don’t think that there is much value in us pushing tech – having an “us” (proponents of tech) and “them” (old-fashioned) attitude will only be counter productive. Of course I always offer to share time and ideas with my colleagues, but the best approach may be to let them see the relevance through our students. And the best place to start is understanding the obstacles! So thanks for keeping this important conversation going! Thanks again for some more great thoughts. If you ever want to write a guest post just let me know! I read Edna’s post too and thought it was terrific. I wish more teachers would read it! The issue of why is so true. Education in Australia is become more data-based too and I don’t think it’s going to get any better. I’ve always thought a great research project would be to look at ways to assess technology and collate data on the impact of technology on learning. We just have to hope and trust! I am overcoming my own obstacle right now! I’m a bit confused about the change of platform, and as I am no tech expert I am not really sure what it all means. If we has existing blogs in globalteacher do we just carry on as perviously with only as slight change or url, or does it mean we have to actually export the info then import it into a new blog. I am worried that I may lose previous post/pages- and want to make sure I get it right before the school year starts! LOL, you’re not the only one confused. I am too! Not sure about the Global Teacher issue. I’ve been told there should be an email explaining it all very soon. I’m hoping I’ll have time to write a post this week about the new platform too. Kathleen, I really like your diagram, it succinctly depicts the perceived roadblocks to integrating technology. While some of these are, of course, true (a teacher truly may not have the time), I suspect that the majority are excuses, a way to play it safe. I have so enjoyed reading your posts. I still can’t believe that it’s been just under a year since I discovered this educational blogging world. I wouldn’t want to go back to teaching in a time without it. I feel like my educational perspective is constantly progressing and being refined. My students are truly benefitting from the impact that all of you, Technology Specialists, are having on me as a teacher. The comment that stood out most to me is that, “teachers need to realise that their students are really missing out if they feel they cannot or will not integrate technology into their classrooms.” This is certainly true where I work. At this point in my teaching, I have worked in the same district for the past 8 years. I have taught kindergarten, third grade, and (currently) technology. These years have been spent teaching in four out of our eight elementary buildings. So, I have seen a wide range of teaching ideas, skills, methodologies, and life perspectives in a short amount of time. I have had the honor of working with some truly incredible educators. I have come to appreciate that there is not just one correct way to do things. I think that fits very well with our perspectives on 21st century learning and digital literacy. This just needs to be a matter of continuing education. So many teachers just don’t know what’s out there. I didn’t. Now I’ve learned so much and can appreciate its value that I feel an obligation to share this information with others. I feel like I am in a position to educate my colleagues about the potential that technology facilitates. With all of the fabulous teachers out there, we should recognize that it’s not about reinventing the wheel, it’s about refining it so that we can go places that we’ve never been able to before. I will be presenting to an elementary staff for the first time next week about the topic of technology integration. So many speakers I’ve listened to in the past, talk to teachers like they finally have the answer that no one has ever thought of before. I don’t want to speak in a way that takes for granted all of the expertise each teacher already has. I simply want to direct them to the wealth of information that is available to us now and the incredible potential it has for authentic, meaningful learning for our students. Teachers need to be using a cross-curricular approach. First of all, if they are not, they are just making it hard on themselves keeping everything separate. Secondly, the students’ learning will be disconnected and shallow. Technology provides the perfect platform for integration. I think so many teachers are hesitant to incorporate technology because it’s just one more thing to add to an already jam-packed curriculum. Instead, we need to view technology as the thread that ties it all together. Connected learning is meaningful learning. Thank you for the time that you devote to sharing your thoughts, ideas and resources with us! Kathleen, I think that you hit the nail on the head here. What all of this boils down to is excuses to not learn something new. We would never let students get away with these types of excuses for not learning. We push our students forward through the hard bits so that they can experience success in their learning. Teachers may need support to get them to the point where they feel success in their learning but the excuse above are not (in my opinion) a valid reason to not learn something new. Learning in a style that does not come naturally to us may be a challenge, but it is not impossible. It is worth taking that challenge and remembering what it is like to learn something new. It builds a whole new framework and empathy for students who struggle to learn. @ Kelly, couldn’t agree more. We certainly wouldn’t let students get away with not learning something that was tricky for them if it was important. Good idea trying a learning style that is a challenge for us to remember how it feels! Thanks for your thoughts. I’m not sure if I was misunderstood. Please let me clarify. I was not saying that I condone these excuses. I was just adding to the conversation, contributing a reason that people I work with fall back on. I agree with the statements being made here. As part of the conversation, I’m suggesting/agreeing that teachers do need to get educated about the importance of using technology in the classroom. As an extension of “Unfamiliar learning style,” “lack of experience/education” could be added to the list of teacher excuses. This is the excuse that I see from my colleagues most. 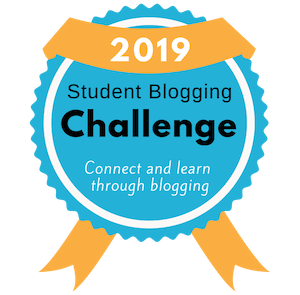 I am one out of two teachers in our entire district that blog with students. I feel that more classrooms need to be incorporating technology, not just assuming someone else will teach them. These great teachers I’m talking about aren’t even thinking about getting educated in how to incorporate technology. They are simply writing it off. I know that they shouldn’t be. That is why I am being an advocate for integrating technology with a cross-curricular approach for authentic, meaningful experiences. The traditional teachers could offer their students so much more than they are currently by putting forth that same effort that we require our students to do. As Mr. Salsich commented, I am also trying to model the engaging nature of technology and I am constantly trying to make it relevant. I only see my students for 60 minutes, one time each week. I could do so much more with my students if I had them all week. Since I don’t, I want to show the teachers that do just how relevant all of this is. I follow the blogs of 4 people who’ve commented on this post. You are who I share as a model for the potential learning that can occur. In my upcoming presentation, I am referring the teachers to several articles written by Ms. Tenkely. I think they will find them to be informative and relevant. I love to see what Mr. Salsich’s third graders do with science and what he, Miss Jordan and Mrs. Morris have done with Social Studies, like the Ugandan Global Project. The Language Arts growth seen on these blogs is amazing! It is a visible example of how offering an authentic reason for using their skills can make such a difference. When I said, “With all of the fabulous teachers out there, we should recognize that it’s not about reinventing the wheel, it’s about refining it so that we can go places that we’ve never been able to before.” I was implying that our current technologies are how we can refine and the places we can go are around the world, flattening classroom walls with Skype. I was agreeing with Kathleen’s statement that “There is so much support out there, you just have to find it.” My colleagues don’t even realize what they are missing out on. So, I am being vocal and telling as many teachers as will listen to me. Thanks so much for taking the time to share your experiences. I think you’re doing an amazing job considering you only have the students one hour a week! That really is an example of overcoming obstacles successfully! Thanks so much for sharing our work with other teachers. You have a great message to share to them and I’m sure many of them will be inspiring after hearing you. As you said previously, I think a lot of teachers don’t know what is out there and it is so true – you don’t know what you don’t know! You do need someone to introduce you to the possibilities and encourage you to start exploring. I really think you’re going to make an impact. I too am always trying to tell teachers that technology isn’t an add-on. It’s all about integrating and finding the best way to do that in the classroom! Good luck with your presentation, Kelly, and thanks for sharing your wonderful insights! We look forward to continuing our blogging buddy relationship with you this year. Thanks for your comment. I would definitely recommend setting up your blog as “Mrs Morris’ Blog” or whatever rather than “2KM Blog”. I have made this mistake myself and when I change grades I can’t keep the blog. Linda Yollis calls her blog “Mrs Yollis’ Classroom Blog” and it has been going for about four years now with different cohorts of kids. She has been in third grade the whole time but it wouldn’t matter if she was in third, first, fifth grade or whatever. She could keep the same blog going. it is such a shame for a wonderful blog to die!